There are many varieties of succulent plants to choose for the perennial garden. These no-fuss beauties are easy to plant and require no intervention on our part. Once planted, they flourish so well, the only care they need are dividing when cramped because they grow so quickly, and then only to increase again in their newly planted location. 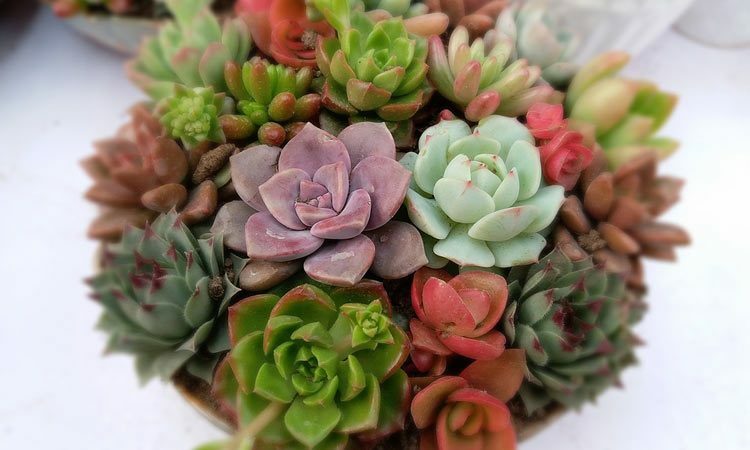 As the name suggests, succulents store water in their thick, fleshy leaves, thus being able to go for lengthy periods without any water. They can also withstand the harshest of weather, still thriving after many thaw and freeze cycles of winter. 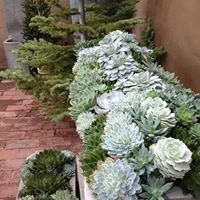 Succulents grow in shade or hot sun locations, only needing care just after being planted; watering well for the first week or so to settle them in. The soil can be clay, sand or gravel with a mix of compost or topsoil to get them started. They do bloom, usually in shades of yellow or pink, some blooming in summer and others in fall. Leaves too, can be interesting in themselves; white or yellow variegated, burgundy, pink or brown tinged and grey. Some purists remove the blooms, believing the plant is better grown for their foliage rather than their flowers, but I enjoy seeing their brilliant blooms that make the plant seem to come alive. Burro’s Tail – A great conversational plant, grey rosettes continue to grow longer and longer as the season progresses, trailing along the ground as they go. Tiny clusters of inconspicuous yellow flowers are formed on the very end to the rosette. Hard to transplant when they are long, it is better to split the clump early in the spring before they have put forth substantial growth, or take cuttings and root them in moist soilless mix during the growing season. They do not like being transplanted, so thought must be taken before planting them in their location. Golden Carpet Sedum – Growing only 1 inch tall and very tightly together forming a mat, this plant spreads readily but is very easily controlled. Flowering throughout the summer with brilliant yellow little stars, this plant is worth any spot in the garden, as only a limited number of perennials flower so hard for so long. This plant is so forgiving and easy to propagate; simply remove a section and plant where wanted or even easier still, break off pieces and press them into the ground with your foot! This is a great heavy traffic area plant as well. ‘Autumn Joy’ Sedum – Tiny salmon-coloured, star-like flowers form in tight clusters atop 1.5 – 2 foot tall stems in late summer. As fall approaches these same flower heads turn darker, blending well with other perennials in bloom. Propagating of this plant can be done two ways; either splitting the clump in early spring or taking cuttings throughout the remaining of the growing season. Cuttings can be rooted in water then planted in moist soil until planted out in the garden. ‘Vera Jameson’ Sedum – Very similar to ‘Autumn Joy’, only being 1 foot tall and with purplish leaves and dusty-pink flower heads that appear from late summer until frost. Dragon’s Blood Sedum – Thick reddish leaves trail to make wonderful mats along any rockery. Showy light red flowers appear in the summer making the total height of this plant 6 inches tall. Hens & Chickens – A very popular, easy-to-grow-anywhere type of plant. It grows 2 – 4 inch tall rosettes of thick green leaves tipped in red produce baby “chicks” that root themselves around the mother plant. A red rosette variety is also available. The long tap roots, similar to dandelion roots anchor the plant in place, so severe as much root as possible when moving the plant to a new location. It does bloom, although not readily, pink daisy-like blossoms in a rosy pink. Hens & Chickens ‘CobWebs’ – Very similar to the regular one, except fine silver hairs weave among the leaf tips, very similar to a spider’s web. The rosettes are grown more tightly together than the regular variety but this is surely a great novelty plant. Once you have sampled a few tucked in one corner or another, you will be experimenting with more I am sure! Don’t limit yourself to only flower beds; think flat patio dishes, cement troughs or small water features. The only limitation you have is your imagination.